When Huey Long was asked by a reporter to describe himself, the Kingfish replied he was sui generis, Latin for ”one of a kind.” That description could also be used for longtime St Bernard Parish politician Henry ”Junior” Rodriguez, who passed away earlier this month after an extensive hospitalization. Junior was more than a seasoned politician, he was an icon and a force of nature. People who were first exposed to him via the typically unflattering media coverage thought him a crass political parochial caricature, though those who met with him came away impressed. Behind the thick white Disco-era sideburns and beneath his trademark black leather vest and lavender turtleneck (attire that his daughter derided as his ”gay cowboy outfit”) was a keen political mind, a wealth of knowledge about local government, and a passion for protecting his community. The first time I saw Junior was while watching news of what was a standard raucous parish police jury meeting. When the presiding officer grew tired of the abuse “the gentleman from Down the Road” was heaping upon him and cut off Rodriguez’s microphone, Junior whipped out a bullhorn and continued his tirade. I was 9 years old when that happened and 17 years later I would serve alongside him on the Parish Council. Junior’s political career began with an unsuccessful run for Police Juror in 1972, warning voters in an alarming newspaper advertisement that the parish they could be saving was their own. Residing in the far Eastern end of the parish (Junior had actually spent some of his early years in Arabi and attended Holy Cross), Rodriguez was an early ”Cassandra” warning the national political powers that be about the damage the Mississippi River Gulf Outlet was inflicting upon the wetlands and thus making St Bernard and the lower Ninth Ward succeptible to catatrophic hurricane storm surge. It was ironic that Junior was the parish president when his omen came to pass when Katrina struck in 2005. In 1975, Junior was elected to the Police Jury and would win re-election to his eastern St. Bernard bailiwick three more times. While the political scandals of the 1970s and 1980s would lead to changes that would mark the close of the Police Jury era, Junior proved able to adapt, winning a seat on the new Parish Council (one of only two Police Jurors to make the transition). The structure of parish government had changed in 1991 but the culture was changing too. In 1999, Junior was the lone Police Juror on the Parish Council and term limits meant he had to broaden his appeal to remain in government. 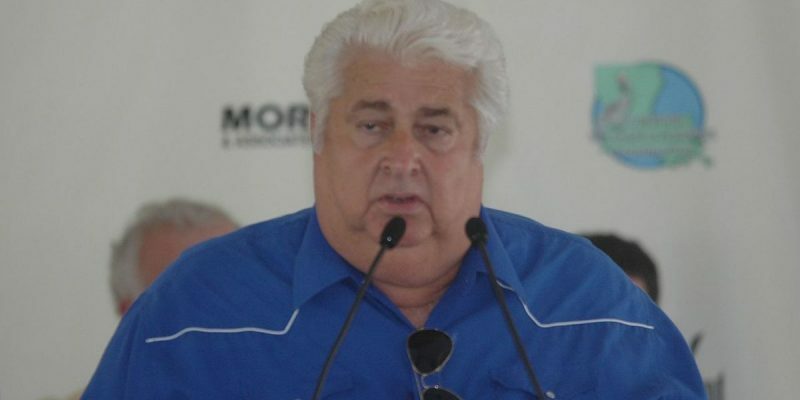 The odds were not in his favor as the population of St Bernard was weighted ”up the road” and Junior was mired in a controversy of his own making by casually blurting out racial slurs in a public meeting. The Times Picayune was on the warpath and black political leaders in New Orleans crossed the parish line to hammer Junior at Parish Council meetings. Add to the mix that the parish’s rising political leadership saw an opportunity to finish Rodriguez off in a parishwide contest for councilman-at-large. With no friends to turn to, Junior executed a Nixonian political play by turning to his fiercest political opponent State Senator Lynn Dean, as the parish political class decided to also dump St. Bernard’s other colorful politician in the same cycle. Despite having defeated Dean’s son for councilman four years prior, the two wily politicians worked together out of self-preservation and both pulled off upsets. It should be noted that Junior had carried predominantly black precincts in that election and in his future campaigns. While black voters didn’t approve of his mouth, they trusted Junior’s heart. The alliance of convenience proved temporary when Dean blindsided Junior with a surprising endorsement for another candidate for parish president. However the ever-resourceful Rodriguez proved to be up for the challenge despite being opposed by the sheriff, Senator Dean, and a wealthy self-funded candidate by exploiting a commercial showing the three politicians carving up a turkey. Junior distributed flyers across the parish alleging that St Bernard was the turkey and the message resonated with voters wary about too much power being consolidated into too few hands. Junior once again prevailed over the political class though his victory party at the famous St. Bernard eatery Rocky & Carlo’s proved to be the highwater mark of his time in government. Fate would not be kind, starting with his inauguration ceremony when his wife injured her hip and had to be removed on a stretcher. Junior would have his own trip to the hospital, being sidelined for many weeks with serious medical problems. While the international media focused on New Orleans, he presided over a community that was a total disaster site in which every residence but five had been flooded. Yet the tragedy seemed to bring the ailing politician back. Despite being ignored by the government and the press, Junior was hell-bent to bring the parish back through quick action. St Bernard residents were able to access their homes long before New Orleans allowed their people to return and his administration feverishly worked to restore essential services such as potable water and power. From there Junior pushed hard for the quick reopening of the school system. While debris piles were everywhere and many structures would stand empty and gutted for years to come, St. Bernard Parish wasn’t back but it once again had a pulse. Unfortunately Junior’s role in building the foundation for the parish’s recovery were overshadowed by his infamous presidential “goosing” of George W. Bush and his vocal-yet-justified criticism of FEMA. Frustrated by the perception that Junior wasn’t advancing the pace of recovery fast enough, the voters turned him out of office in 2007. Junior’s over thirty years of public service had come to an ignominious end. In a visit with the Big Man two months ago, Junior expressed his disappointment with that contest though defeat finally allowed Junior the time to enjoy the fruits of his three decades of labor. In closing, I can attest to Junior’s love of St Bernard and heritage, from his involvement in the creation of Los Islenos Society as a means of promoting the parish’s Canary Islander culture to providing support for the Battle of New Orleans reenactment. Another admirable trait was his self-confidence, which is not to be confused with arrogance. Junior was one of those rare politicians who could be convinced to reconsider a position based upon its merits. Most politicians are too vain and insecure to back away from a previously held stand. Junior never assumed the best idea was his own. Few local elected officials have ever demonstrated the degree of dedication to their positions than Junior had, going beyond attending Parish Council meetings but also going to meetings far beyond the Industrial Canal to represent the interests of our community. While his fashion sense and language at times are best not emulated, Rodriguez’ passion for public service should be. When St. Bernard was down after Katrina, he was our champion helping get the parish back on its feet and telling the world St. Bernard’s story. Godspeed to a colleague, friend, and truly one-of-a-kind leader.